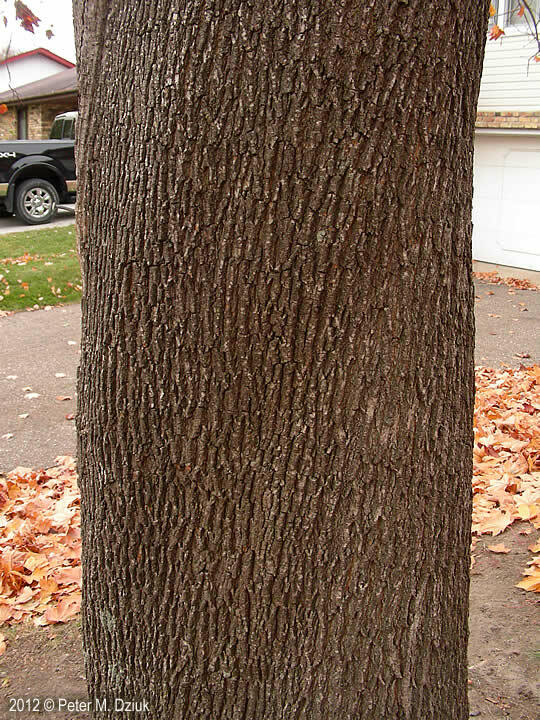 Photo: Acer platanoides.commons.wikimedia.org. (Accessed 6/2014). 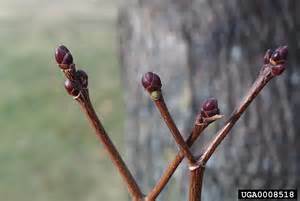 Acer platanoides is a canopy tree, old bark black, narrowly, longitudinally fissured and ridged in a fairly regular pattern, bark of young trees gray, smooth; terminal winter buds large, 0.6-0.9 cm, wider than twig tip, green, to dark purplish, bud scales 3-4 pairs; twig and leaf stalk sap milky. Norway maple is very shade tolerant it casts dense shade that keeps out all seedlings other than Acer platanoides and other very shade tolerant species. Leaves opposite, blade 8-18 cm wide, wider and darker than A. saccharum, but otherwise very similar; autumn color clear yellow (never red or orange) turns later than native Acer spp. Acer platanoides.flowers.John Hilty.www.illinoiswildflowers.info (accessed 8/2016). Fruit dry thin, flat, winged seeds (samaras) joined end-to end, large, each 3.5-5 cm long, wings widely divergent, curved upward; ripens Sept.-Oct., wind dispersed; seeds probably eaten by some birds and small mammals. Acer platanoides.bark.2012 © Peter M. Dziuk.minnesotawildflowers.info (Accessed 8/2016). Habitat: Upland, woods and edges. Invades intact forests. Used as street, park and garden tree. Leafs out earlier than native forest plants and remains green longer into autumn, out competing native trees. 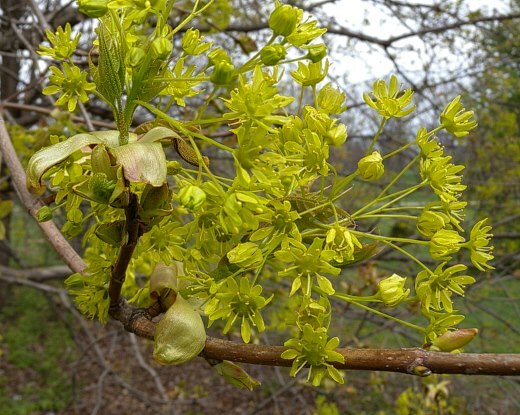 Reproduces freely and shades out all other plants but beech, sugar maple and Norway maple seedlings (Webb and Kaunzinger, 1993; Wyckoff and Webb 1996). Soil under dense stands of Norway maple is subject to erosion due to lack of ground cover (T. Wenskus personal communication). Soil pH 5.2-7.2 (USDA-NRCS 2004), in NYC found in soil pH 7.4-7.6 (Gargiullo unpublished data). Tolerant of salt and compact soil (Del Tredici 2010). Acer platanoides.buds.Paul Wray, Iowa State University, Bugwood.org Creative Commons License licensed under a Creative Commons Attribution-Noncommercial 3.0 License. (Accessed 8/30/2016). Anoplophora glabripennis (Asian long-horned beetle) Enschede2008. commons.wikimedia.org (Accessed 8/2017). Notes: Attacked by Verticillium wilt, Verticillium dahlia (Deuteromycotina) a soil fungus that travels in xylem and causes progressive die off of branches. Anthracnose disease, appearing as dark, necrotic, spots or scorch-like appearance of leaves, caused by Kabatiella apocrypta (Ascomycotina). Didymosporina aceris (syn. Marsonina truncatula, Deuteromycotina) causes two-toned tan and brown spots on leaves (Dirr 1990; Sinclair et al. 1987; Agrios 1988). 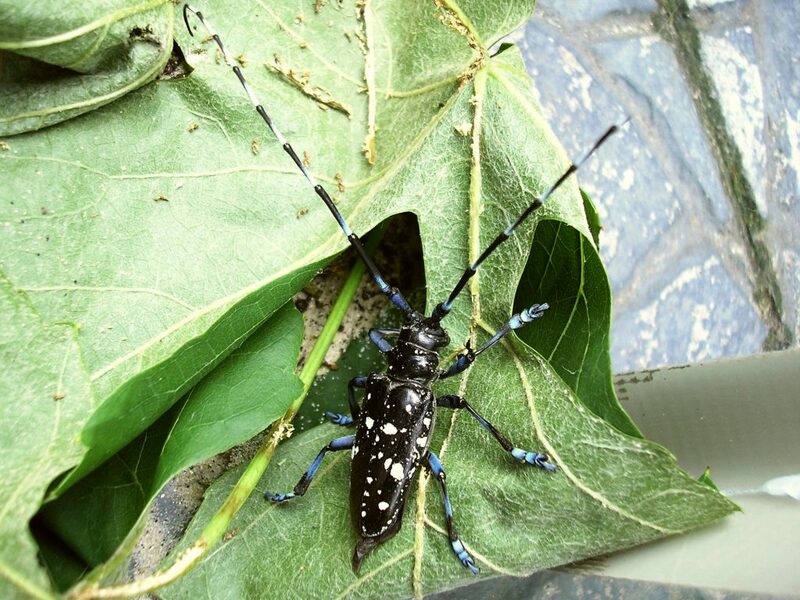 A primary host tree of the Asian longhorn beetle, Anoplophora glabripennis. This is a large, 1-1.5 inch long, black insect with white markings and elongate black and white striped antennae. It lays its eggs in small pits or slits chewed into bark of the upper branches of a tree. Larvae tunnel into the wood and form extensive galleries through the sap and heartwood, they pupate near the surface of the wood and adult beetles chew a large exit hole 3/8-1/2 in., wide through the bark to the outside. Other symptoms of infestation are thin, sawdust like larval droppings in branch crotches and around the tree base. Infested trees must be cut, chipped and burned to prevent spread of the insect. The beetle arrived in raw wood pallets from China as early as the mid 1980s. It was first discovered here in 1992 in Massapequa, Long Island. It presents a critical danger to the hardwood forest of the northeast. 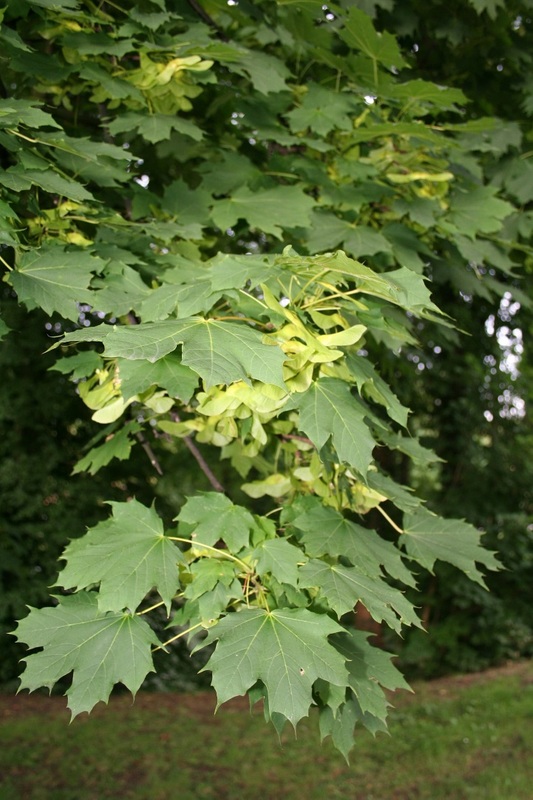 Norway maple is a major pest species in and near urban areas. Listed as an invasive alien by the Invasive Plant Atlas of New England (Mehrhoff et al. 2003) but continues to be grown by the NYS Nursery. Reproductive adults can be killed by girdling or by heavy canopy pruning for a couple of years. This also sharply decreases seed production. Hand pull seedlings. Weed wrench saplings. Removal of seedlings alone encourages growth of more Norway maple seedlings, whereas removal of canopy trees has been shown to decrease Norway maple seedling populations (Webb et al. 2001).